Khakassia, a southern Siberian land, welcomes travelers that enjoy immersion in local cultures, traditions and atmosphere. Come here to find rare cave paintings, celebrate New Year’s in spring and taste the slightly pungent taste of ayran on your tongue. One of Siberia's most picturesque roads, the Yenisei (Road P257), stretches from Krasnoyarsk to Abakan, the capital of Khakassia and continues to the Russian-Mongolian border. If you drive slowly you can feel the quiet, calming breath of the huge Siberian steppe. Once you open the window, the car will be filled with the dry and fragrant scent of herbs, honey flowers and thyme that hide between the rocks. Visiting Khakassia is like receiving a holographic postcard from an enigmatic land where flat objects gain volume if you look at them from certain angles and simple things become full of mystery and meaning. As you look into the distance, instead of a flat surface, which is considered typical for steppes, you'll see a three-dimensional landscape with hills carving the horizon, like woolly camels' humps and the bright ocher of stones replaced by green wild herbs and yellow feather grass. Travelers come here to see the remains of ancient cultures, as the region counts more than 1,000 age-old steles, tombstones and petroglyphs. The neolithic carvings of Boyarskaya Pisanitsa, which depict ancient settlements with yurt-like constructions, scenes of livestock farming and food preparation, are a rare landmark for Eurasia. The locals' preferred destination for weekend trips is the Bolshoy Salbyksky burial mound and the Sunduki Mountain range. The range consists of five mountains that resemble five sleeping giants. Once upon a time they once served as a natural observatory: Rocks, openings and holes functioned as a sun clock, while the mountain tops were used – and are still used – for shamanic rituals. "Once we decided to spend the night on the top of the first mountain to take photos of the stars and the rising sun. The night was over in no time and the sunrise was majestic. The view from the top extended for many miles in all directions. At night a local guard was telling us his stories by the fire. Then a thunderstorm struck. We woke to the sounds of a shaman's drum and throat singing: somebody was performing rites on one of the mountain tops." Shamanism is still alive in Khakassia. As you drive through you can see rocks or trees by the road with colored atlas ribbons tied to them. If you try to put something in your pocket to remind you of the steppe, such as a pebble or some herbs, locals will ask you to put it back, as they consider every tiny element of nature to be sacred and to possess special powers. Lev Gumilev, the well-known Russian author and cultural geographer, wrote that everything we see has an ethnicity to it. Similarly, a trip to Khakassia is a quest for a well-preserved local ethnic identity. The Khakassian calendar is a good place to start. The spring equinox, Chyl Pazy, is one of Khakassia's most celebrated holidays. Major festivities take place in Abakan, the regional capital. It is the Khakassian New Year. On this day, the capital is full of people from villages and small towns, who set up yurts in the main square, cook traditional dishes and sing songs in their native language. When nomads start moving livestock to summer pastures, it is time for Tun Pairam, the feast of the first ayran, a sour dairy drink made from cow’s milk. 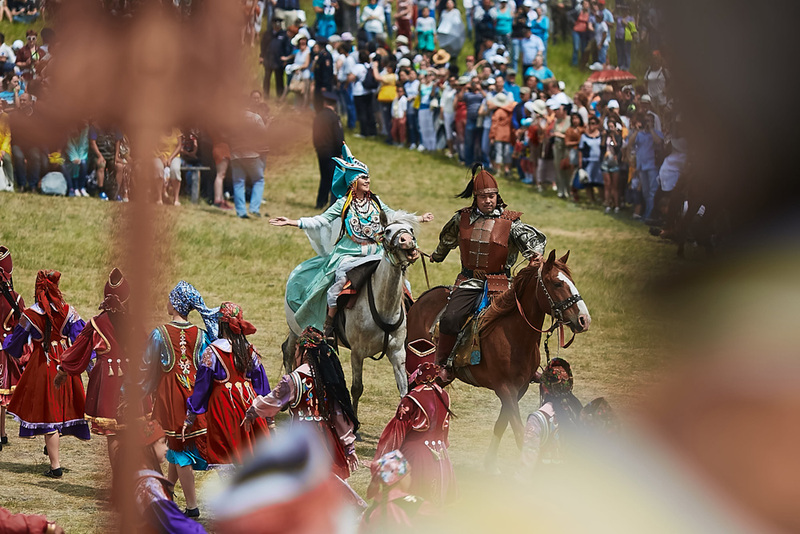 Festive activities of the holiday include charys (Khakassian horse racing), storytelling contests, and traditional costume and archery competitions. The cuisine of Khakassia is probably one of the most conservative elements of the local culture. Traditional clothes are replaced by modern ones, old languages are forgotten and old gods are abandoned, but traditional recipes are passed on from one generation to another. Local meat delicacies are definitely worth your attention, as Khakassia has been a land of livestock farmers for many centuries. Abakan shops sell khyyma, sausage from chopped beef and horsemeat, and if you eat out remember to order mun, boiled mutton with broth, or kyoptirges, an unsalted flatbread traditionally baked on stones in a yurt. As for traditional Khakassian drinks, you should try ayran. "Ayran is the key to good health," say Khakassians. Nomad-style tea with milk is not as popular here as in Tuva, but the locals often drink herbal infusions of black currant and lingonberry leaves, with rosehip and thyme, which is called "irben" in Khakassian. In the olden days such tea was served with oreme, boiled milk foam with ground bird cherries, which was prepared on special occasions. Today oreme is made from sour cream and you can taste it in local cafes.